#trusteehour discussed fundraising tips for trustees after #scvogathering (Feb, 2019). We thank @HIVScotland for sharing the Institute of Fundraising free Trustees and Fundraising guidance, produced in partnership with CFG, NCVO and ACEVO. This includes a handbook, powerpoint presentation, ten top tips, blog and the below animation. It is not worth repeating the top ten tips here, please view them directly on the IoF website here. OSCR also has some excellent advice on its website, covering regulation, rules, Scottish charity law and handling complaints. Other than the general guidance available we considered the potential of a ‘Fundraising Trustee’ role. This was seen as positive and many suggestions were made on how best to get value out of trustees with fundraising experience and interest. Plus, the recognition that all trustees have collective responsibility for fundraising. The International Voluntary Service @IVSGB kicked off the hour with a poll on the question posed. 86% of participants agreed that the role should remain voluntary which dominated the conversation with some thoughts on the influence of rumuneration and whether this would attract different voices into the sector. @BCharitable also provided a useful context to the discussion by recognising the professionalism of the sector and that the contribution of trustees should be recognised, encouraged and supported. There were many comments that training should be mandatory to improve standards of governance (@Menai_OJ) and removing of barriers such as travel and other expenses being made available without stigma (@Sus_Hunter20). @Sus_Hunter20 also noted that timing for meetings is important so that trustees that are in work (comment made in the context of #youngtrustees) don’t lose income or have to take leave to attend. @LaurenPluss suggested that it is important to promote the positive impact that involvement can have on an individual as well as an organisation. @weavermiles saw the merit in the principle but commented that you need to be paying tax for this model to work. Yet we want more young people, to attract all earning levels and of course, the majority of the trustees are retired. One way of supporting this is to encourage more organisations to have a policy on volunteering and talking up #SkilledVolunteering. Trusteeship being the ultimate of skilled volunteering? @OfficialCause4 supported this by suggesting that corporates can do more to allow time to support volunteering. Effectively, the worker is paid but can gain new skills and experiences too in the form of a trusteeship. Another suggestion focused around a unitary board model, like the ones seen in the corporate world. This would mean the trustees would act in the same way as the non-executive directors. Next #trusteehour on Tue 13th Nov 7-8pm is a special #TrusteesWeek collaboration with @WalesCVA looking at what trustees need to know and do about Safeguarding. 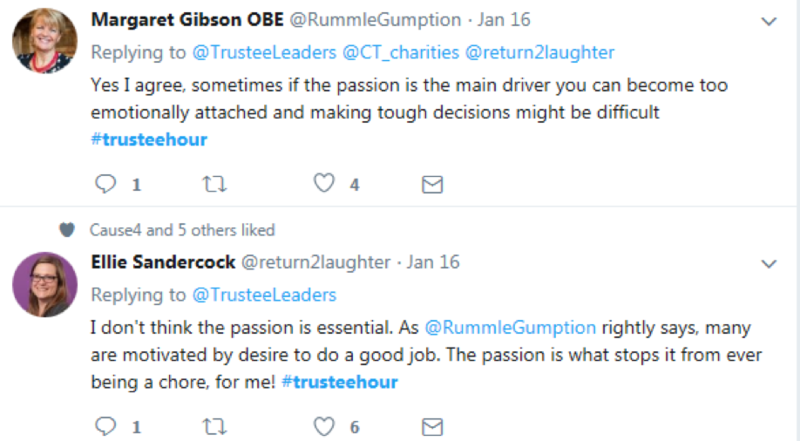 Reflections on #trusteehour 8: When is it time for a trustee to step down? Our last #trusteehour (12th June) asked the question: When is it time for a trustee to step down? We always encourage contributions and themes and this time this one was provided by @MairWCVA. This is a good question in its own right. However, we have discussed in the past the need for many organisations to simply recruit more (of the right) trustees. You don’t want anyone to resign, surely not? Well, they must, but when is the right time? We had many really interesting contributions that took us in a few different directions. We then turned to the charity governing documents by considering the kind of length of tenure participants had typically seen as a limit? @TrusteeLeaders responded to suggest that they will be putting into the governing doc a tenure limit. @ian_mcl suggested that 9 years should be the maximum, except in expectional circumstances. Many participating in a poll posted by @weavermiles could find examples of trustees being on the board in excess of 10 years. At least @getonboardCmyru made a joke by saying even if a board recruits a young trustee it’s likely that after 9 years, that they will still be young! Another suggestion was posed by @ian_mcl who noted the importance of a trustee appraisal. He continued to note that too few do it, but it helps you have conversations that need to occur. This would provide a good opportunity to review relevance and fit between role and the board. @talktokieran offered some interesting advice to see if the board has had any difficulty with trustees attrition. He suggests to review members under three years to see where the problem might lie (or more specifically with whom?). @BCharitable suggested ‘Rotation’ provisions might be best for some but not others and added “whatever is used, needs to be informed decision before things are ‘locked in’ & affects board effectiveness in time”. @Weavermiles started a poll around another suggestion that he saw happen with a board. That being a “three strikes and your out” policy to ensure good attendance. Members are of course allowed to register apologises. @sallyld did ask us all to consider whether attendance at meetings necessarily equate to quality input and good governance. @JoGibney below said that it is a red flag and may well indicate lower input and engagement. I think this might be a good topic in its own right for another time? The next trusteehour is coming up on Thursday 19th July 8 – 9pm. See you then? Our third #trusteehour for 2018 in March sought to tackle the ‘elephant in the room’, which had been suggested as a topic back in 2017: GDPR. With the implementation date not far off on 25 May 2018, it seemed a good moment to encourage resource-sharing for charity trustees still looking to get their heads around what’s involved. We had around 2,500 views during this trusteehour, with a number of online references shared. This link is for the Information Commissioner’s Office FAQs for charities. There’s also the resources brought together by the Institute of Fundraising. Information and guidance from NCVO was also shared. And finally, news of our next #trusteehour on Thursday 19 April 8-9pm – topic “demystifying charity accounts”! 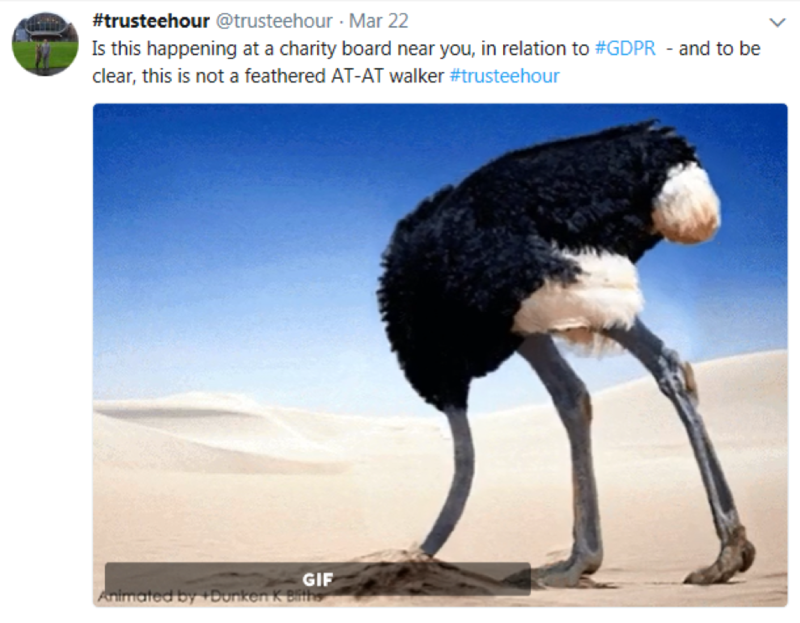 Reflections on #Trusteehour 6: on the topic of #GDPR – offering help and support to charity trustees, 2 months to go! Oh #GDPR that elephant in the room … or might that be the elephant constantly pounded thier way towards you? It seems as if everyone has heard about #GDPR – that “stop spamming me thing” – well it’s not quite that simple. Actually the level of engagement in this topic was much lower than others and many of the contributions were offered by #GDPR consultancies and service providers. There certainly is alot of support out there and for some – a business opportunity. For others, a real headache. Julie kicked-off by providing a link to FAQs for charities, that can be accessed here. @TrusteeLeaders provided useful IoF guidelines, here and @CT_ Charities suggested looking a @ICOnews resource that contains data processing maps and other free tools to download, here. We had our first tumbleweed moment. Some of you might know that Julie and I, usually meet for a drink to host #trusteehour and we soon realised that our drinks were going down quicker than normal. We are usually huddled around our smartphone, with a little glance at each other when the conversation hots up. Well we kept waiting, until we had a positive tweet from @BruceTaitAssoc. @Osborn_Jo asked whether charities are completing ‘Privacy Impact Assessments’ before any new projects? Perhaps that is something we could look at a later date. 1 Ask yourself if GDPR applies to you. If it does, start planning your GDPR journey. 2 Establish who is going to do the planning and who you need to take with you on your journey. 3 Ask yourself what you want it to look like when you get there. Here is a good concluding tweet from @talktokieran below. Many contributors turned it into a positive and remarked that its manageable if tackled “one piece at a time”. …. We should embrace it. We will certainly be returning to this topic and hopefully more people will want to participate. The first question posed was “If you’ve been/are a charity trustee – do you consciously have a development plan/seek training opportunities?” @CT_charities started us off with a ‘yes’ noting that personal/softer skills are a great facet of trustee experience; serving as a trustee helps with developing understanding of people in a unique way thanks to differing priorities and motivations. @techmeerkat recognised the benefits for staff but added that skills can be developed that can be bought back to a “day job”. Many of us seem to over-use the language of the “win-win” situation. However, there is a clear one here, however recognition of these benefits have yet to resonate much wider with employers? This is changing! @irenewarnermack raised the need for ‘core training’ for trustees. This is exactly why @JulieKHutchison, @JacqBrodie and I have developed a ‘competency pathway for trustees’ and we need your help to develop this further and get it adopted. This recognises that many pathways exist to trusteeship and that we all bring different skills and knowledge into the board room. It is important that we use a ‘skills audit’ to understand these dynamics and actively develop the competencies of our board members and where there are gaps to fill them with new appointees. We then went on to ask about the idea of “lifelong learning” and whether it is something that could be associated with trusteeship? Or whether individual experiences was confined to induction training (if it even happened …)and not much afterwards? This raised a few eyebrows, as we expected, with examples of poor inductions. @lindabarlow101 noted the importance of the simple and small things such as introducing a new trustee at the first board meeting and others introducing themselves going a long way. We cannot assume that everyone knows each other! Thats a start but there is still alot to it than that. I shall add to this the importance of the Chair or another board member building the relationship before the meeting. I don’t know many that like going into a cold room … do you? It’s the price of buying, or better still making a cup of tea. Alot, of lifelong learning is had over a cup of tea … a apple juice … a dram? Everything is about the relationships that we form, surely not? 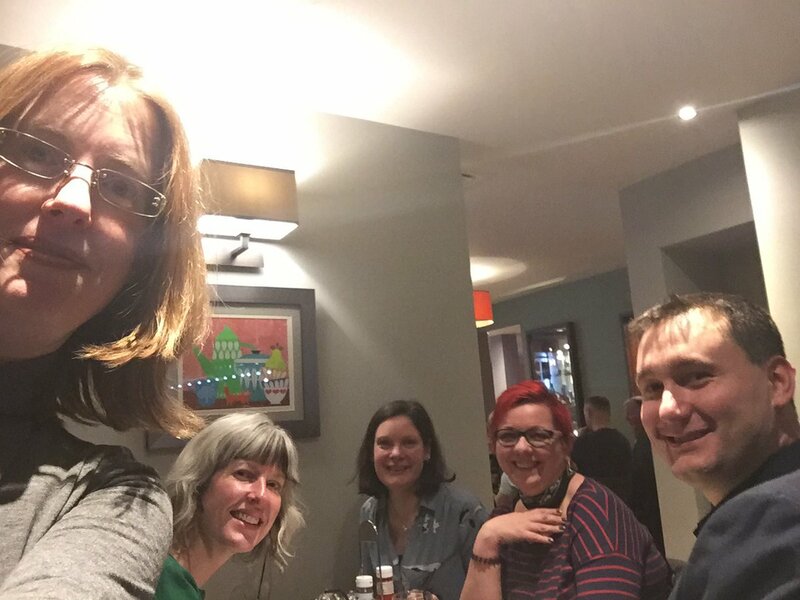 @mrsannrowe raised the issue of holding the ability to have difficult conversations in a productive way (and got excited when many chipped in and we were able to witness this in our meet-up). So OK … how do we develop this? How can we nuture an environment that encourages ‘challenge’? and when conflict arises how can we bring this to a resolution. Well .. this is has to be about the alignment of values and ensuring those that are marginalised by the decisions reached are considered. Moreover, where possible drawn into the decision-making process. This goes to the heart of one of our re-occuring themes – the importance of diversity of thought in the boardroom. For our boards to get the full benefit of diversity, then we need to value difference, recognise that we each bring different capabilities to a board and the Chair and other board members must not “shut-down” discussion when it does not go thier way. This does not distract from the importance of running a timely and effective board. This raises the importance of the ‘agenda’, the craft of chairpersonship and frankly ‘manners’ in the board room. I said to someone recently when watching PMQs with them about the importance of “talking through the chair” and that the chair plays the role in bringing in the views of members and encouraging that “challenge”. They laughed and said “don’t be so stupid”. Constantly recognising that boards should be ‘strategic’ helps. Many recognised the importance of more young trustees on boards – they will challenge the status quo. Do we think enough about the simply things we can do in terms of ensuring meetings are well facilitated? It’s probably one of the main reasons why boards trustees lose interest and may miss the odd meeting? It’s basic stuff but we need to discuss these issues more. There is always room for improvement. Interestingly, this is what delegates of our professional development course (Leadership in Board Governance) asked for more to be included in the learning opportunities and toolbox for trustees that we have developed. Trusteeship provides opportunities to give back, grow and get ahead. We are constantly developing our competencies and forming new relationships … always. It is without question that it provides long-life learning opportunities. But that also depends on whether we continue to serve in different capacities. However, that does not mean we can stagnate and stick around too long? We need to re-assess our competences, what matters to us and where our passion lie and ensure that we give-back in the best way that we can continue to grow and for some to get ahead. This includes that our contribution tanscends the artificial boundaries that we place in what we call ‘sectors’. We may hold different values at home, in the workplace, where we play, study or pray. Some of these are in conflict and we must be mindful of this as this will impact on how we challenge, develop and bring new skills back into the workplace and community. Oh … ha ha … and below is how we looked in the “twenty-tens” with smart phone in hand and heads down. Perhaps we could call this decade “eyes-down” without calling any numbers! It was certainly an experience and nice to catch up and put names to a profile. The next #trusteehour will take place on Thur 22 March 8-9pm. Our theme this time will be #GDPR and help for trustees – the final countdown! Sharing of resources will be much appreciated. I think this is on the lips or perhaps in the ears of all? 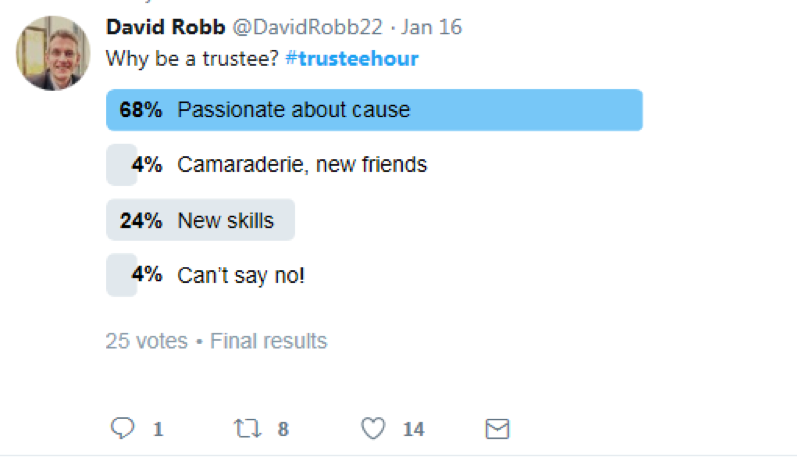 We are always delighted to highlight any trustee opportunities that came up in conversation during #trusteehour. For instance, @TheJubileeCV7 are looking for a trustee (a Community Centre near Solihull)! @YPICounselling also have a look out for new trustees (a #mentalheath charity in the Basingstoke & Deane area). Our second #trusteehour focused on talking about digital leadership & digital inclusion for trustees, employees, volunteers & service users. This topic was nominated by @TheRichDB, Operations Director at @citizensonline1 for #DigitalInclusion, Trustee at @thectsbrighton for tackling #homelessness. @JulieKHutchison opened the session by asking: how do you balance inclusion with making effective use of digital when it comes to beneficiaries who are excluded from the latest tech? Firstly, it must be noted that the participants to #trusteehour are probably digitally literate! So, we must frame the discussion in terms of the 12.6 million of the adult UK population that lack basic digital skills and 5.8 million people have never used the internet, according to a recent House of Commons Science & Tech committee report. This report was aptly titled the ‘digital skills crisis’. This has implications for charity operations and reaching out to beneficiaries as well as the skills that we bring into the boardroom. Of course, there are opportunities to reach and have a meaningful engagement with new communities but often we are attempting to reach those that may not be digitally literature. 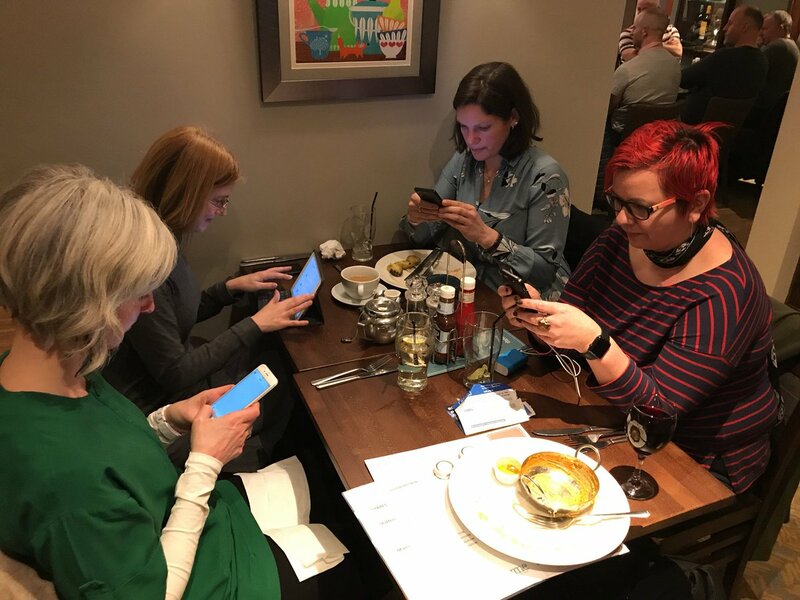 We can’t simply divide the ‘young’ with the ‘old’ as @trusteeleaders highlighted the fact that many older people are tech-savvy and many young people can surf in various social media channels, but might not be picking up the digital skills necessary. I often hear in terms of getting young professionals on board that “they can use social media and help develop a website”. That’s not all they can do and we must remember that they are full members of the board. My 80-year-old bowling partner, Murray, can teach me a thing or two with his iPad (as well as always getting closer than me to the Jack)! He has family in Australia, so knows every trick to maintain his relationship with them via emerging technology. @TheRichDB captured the essence of the discussion when he said: “it’s important to design digital around the needs of digitally excluded people – not just because it’s ethically right, but because it can open up new opportunities to create a better service”. The discussion moved from the digital skills needed for the board, to recruitment and then onto measuring the success in terms of reach and engagement. Firstly, there were many calls for all board members to have digital skills, although it was noted that a good first step would be for one person to be a ‘digital champion’ (e.g. @zoeamar, @trusteeleaders). In @David_McNeill straw poll of 19 participants, 63% suggested the need for a ‘digital trustee’ and 37% that ‘digital’ should be the ‘responsibility of all’. Many cited the potential offered by digital and noting that digital goes beyond Comms and fundraising (@ThirdSectorLab, @sallyld). This did arise as the priority by the 12 respondents to a different poll by @TheRichDB poll. Followed by cultural change, then governance & risk. @David_McNeill also noted that there has been a lot of focus on fundraising but for @David_McNeill, he is excited to see how online platforms are supporting the creation and development of new types of communities / support networks. Sally got a lot of retweets when she said that fundraising is only scratching the surface of the potential offered by digital. @David_McNeill cited examples from antenatal classes developing WhatsApp groups for peer support to Mumsnet forum chat to community Facebook groups lobbying on planning policy and posed a challenge for ‘charities’ and asked the community to consider how this might replace some of their traditional activities. In terms of recruitment, @trusteeleaders argued that we should approach recruitment like you would a paid role – advertise and check their skills set. This is sound advice and this should include a range of digital skills. As noted earlier, the majority agreed that a ‘digital champion’ should be appointed and one of their goals should be to build capability and skills for other members. 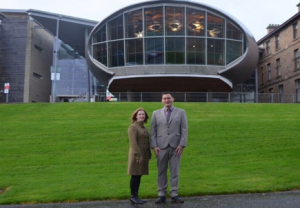 This was supported by Ross (@ThirdSectorLab) who said that this one expert could drive things forward and sense check new ideas, in the same way that every board has a finance expert scrutinising the accounts and encouraging financial good practice. As part of the regular auditing of skills and competences of board members, these skills should be included and if you don’t have them around the table then it would be good practice to go and actively seek them as part of a recruitment drive. @OfficialCause4 raised the issue of ‘measuring success’ in terms of digital inclusion and this led to a discussion on engagement being a much more meaningful way to measure. @David_McNeill stated that we should beware of vanity statistics, noting that “hits and reach with large numbers are often meaningless – “ask what impact the reach has made”. As @OfficialCause4 pointed out “no point having a million followers if only 3 of them are genuine”. Evaluating the impact of our decisions is critical and grow in importance over the years. We need to demonstrate how we reach out to our communities, including how we debate who is included and excluded by our actions and where possible how we can meaningfully engage with those that may be marginalised. It is clear that #trusteehour is raising some interesting questions and good practice is emerging from the two sessions so far. For this one, consensus emerged around all trustees having digital skills but having a board level champion would be a great start. The importance of a trustee competency audit regularly comes up in discussion but in this session, this should also breakdown ‘digital skills’ that the board might wish to develop and seek from new appointees. It is certain that debates around ‘digital inclusion’ in our board rooms will help us to consider who and how we engage and likely to identify new ways to enhance service provision. Next #trusteehour is Tuesday 16 January 8-9pm. Theme? What New Year’s Resolution are you making as a trustee? !